Do your part to save the pollinators - the bees, butterflies, moths, and other insects critical to our food supply and human survival. Plant a "pocket" of flowers that attract and nurture pollinators in your own yard. The pollinator pockets described on this site will make it easy to select, plant and maintain. You may not realize that manicured lawns, exotic plantings, and enticing hybrids and cultivars often provide no value to pollinators. By placing pollinator pockets into your landscape, you provide an oasis for pollinators. Now that's sweet! Check out our Pollinator Pocket brochure. 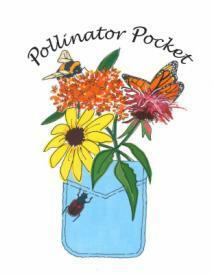 To register your Pollinator Pocket, click here to download the application.